^ Quickfacts.census.gov - Escambia County - accessed 2011-12-06. ^ Quickfacts.census.gov - Brewton, Alabama - accessed 2011-12-06. ^ Quickfacts.census.gov - Atmore, Alabama - accessed 2011-12-06. ^ "Holman Correctional Facility." Alabama Department of Corrections. Retrieved on August 15, 2010. ^ a b "Annual Report Fiscal Year 2003." Alabama Department of Corrections. 33/84. Retrieved on August 15, 2010. ^ "Fountain / JO Davis Correctional Facility." Alabama Department of Corrections. Retrieved on July 4, 2011. 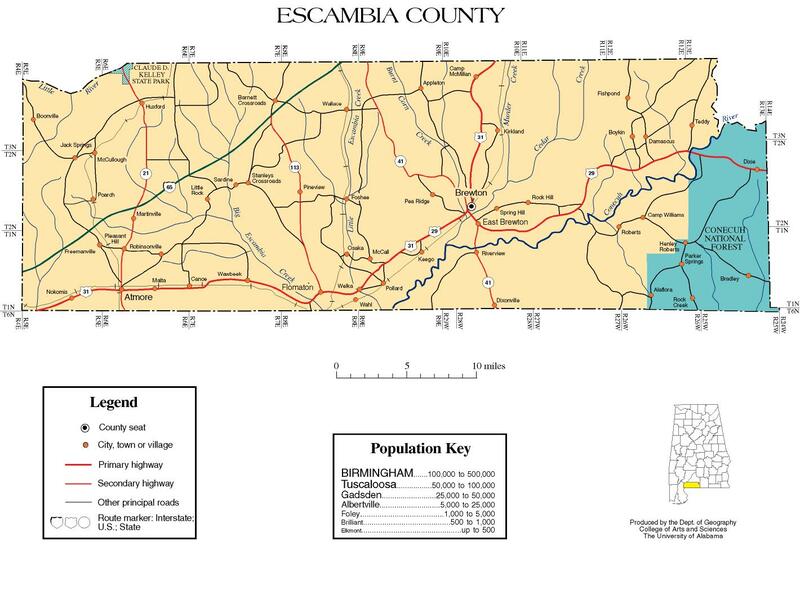 Escambia County map of roads/towns (map © 2007 University of Alabama).